Sebastian Kuhn uses familiar elements, often part of everyday commodities, in order to build his sculptures. Nevertheless, they appear as if not from this world. There is something, in the widest sense of the word, phantasmagorical about them. Kuhn moves, transforms, transfers and exchanges them. He refers repeatedly to the well-known and accomplishes a narrow path between recognition and alienation. Hard, brittle materials such as acrylic glass are made to look like slightly flexible materials, the same way Kuhn’s mirrors generate confusion over the perception of space and time. Kuhn plays with the expectations of the viewer in order to challenge them. Effect and the nature of materiality can be very different. Materiality, physicality, appearance and reality are thus called into question. Space and time, function and illusion are no longer fixed for Kuhn.Kuhn’s sculptures and installations demonstrate that perception and reality do not necessarily correspond. His sculptural and fictional experiences encourage the viewer to question the reality we take for granted and to take a closer look into our familiar horizon. His sculptures invite the viewer to walk around, to consider it from all sides. Inevitably untrained viewing habits and learned truths come to sway. 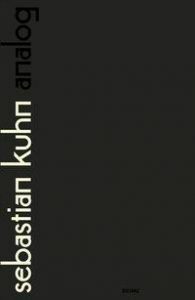 The viewer is integrated and activated.Although Kuhn’s works appear like foreign bodies and overturn well-known laws, they are in themselves balanced. Each part has a counterpart, each surface a condition, each colour a contrast. Kuhn creates harmony and a dynamic at the same time. On the level of meaning Kuhn virtuously returns to a broad cultural knowledge, an eclectic use of art history, literature and film. The titles of his work arouse in the viewer additional associations. Selectively combined and revitalized, he echoes the history of art and makes little poetic ignitions (Max Ernst) act within new compositions. Kuhn dominates the gamut of variation and uses once well-known never-been-there. He allows being at ease with the material, dynamics, proportion, line and gesture and has been focussing on his opponent, taking the viewer, in the tradition of modernism, right into the picture. Kuhn´s wall objects, installations and sculptures are complex reference systems, which the viewer is always to think seriously about. The viewer plays a crucial role in this system.Despite or perhaps because of an expanded notion of sculpture, Kuhn thus shows to be linked to the very foundations of classical design tradition. He creates a new artificial world from old ingredients which works according to his rules but can be interpreted individually.